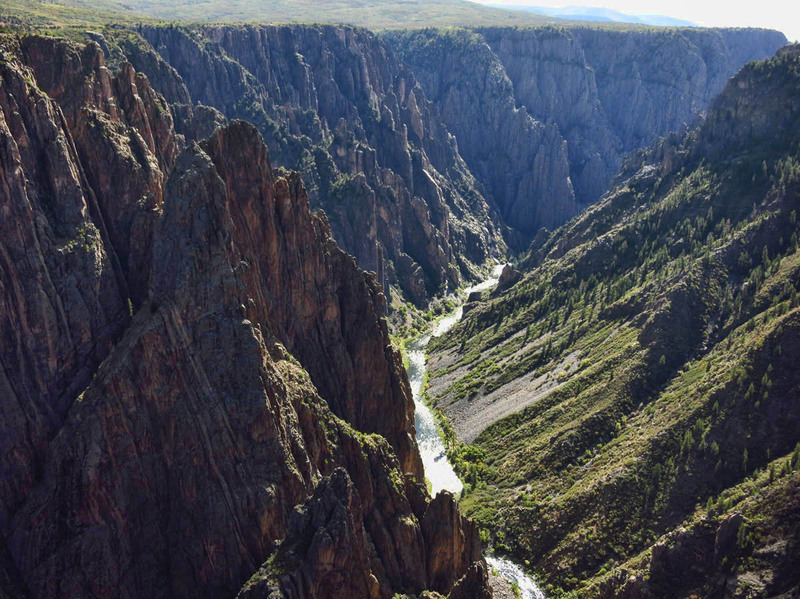 The Black Canyon of the Gunnison National Park is only a small part of the 48 mile long gorge, carved over 2-billion years by the mighty Gunnison River, a tributary of the Colorado River. The National Park protects the steepest and deepest 14-mile stretch of the gorge. 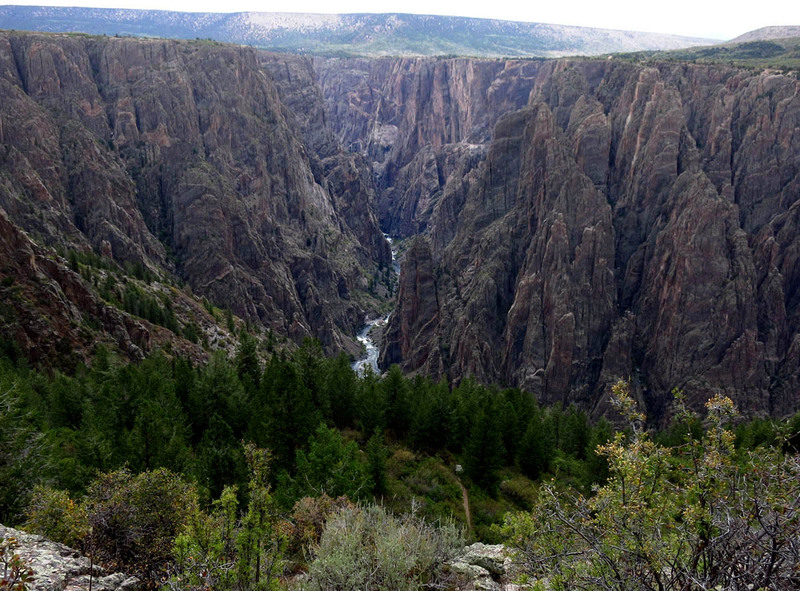 The park is bracketed on both ends by recreational areas; Gunnison Gorge to the west, and the larger Curecanti National Recreation Area the east. Curecanti is formed by a series of three dams; Blue Mesa Dam, Morrow Point Dam, and Crystal Dam, each creating reservoirs of the same name. The largest of these is Blue Mesa Reservoir, Colorado’s largest body of water. 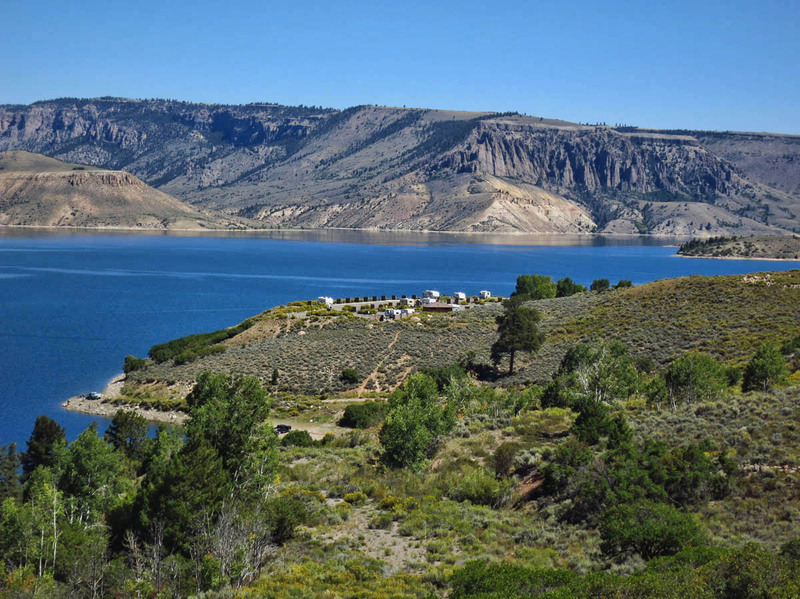 Lake Fork Campground overlooking Blue Mesa Reservoir makes good base for boat tour. Note Winnie on far right. As I continue to work my way around my counter-clockwise loop through southwestern Colorado, I want to explore some of the Curecanti National Recreational Area. 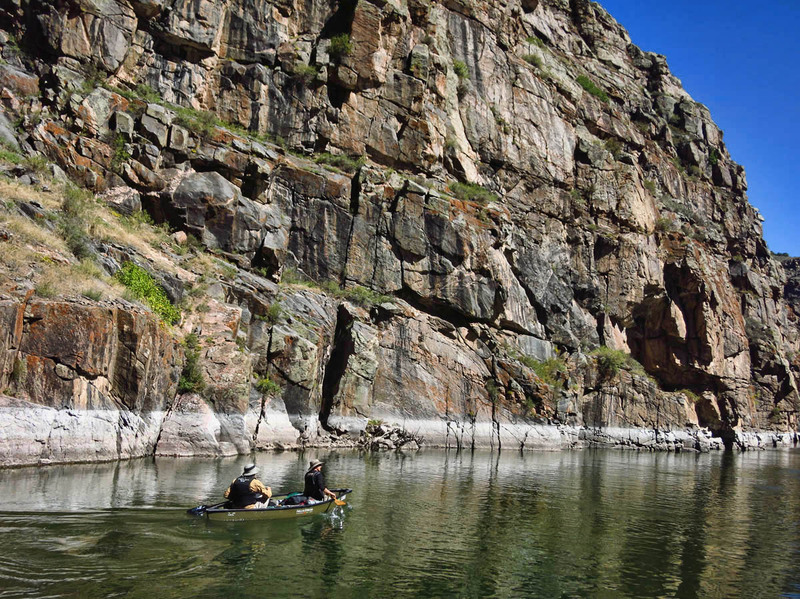 Jim, Gayle, and Debbie have spoken often about a boat tour they took back in 2012 along the Morrow Point Reservoir, through the Black Canyon. I learn that this is the last weekend for this boat trip, so I call for reservations and get in just under the wire. Ranger describes history, but it is Captain who spots bald eagle. Lake Fork Campground near Blue Mesa Dam is the most convenient place to park it while I explore this area. Even though it is an asphalt parking lot with what amounts to enlarged side-by-side parking spaces, it offers 180 degree views of the Blue Mesa Reservoir. It’s only a mile to the Pine Creek turn-off to reach the parking area for the boat tour. That’s the easy part. Then, it’s a 232 stair decent to the river, and a mile walk along the old railroad bed to reach the boat launch. 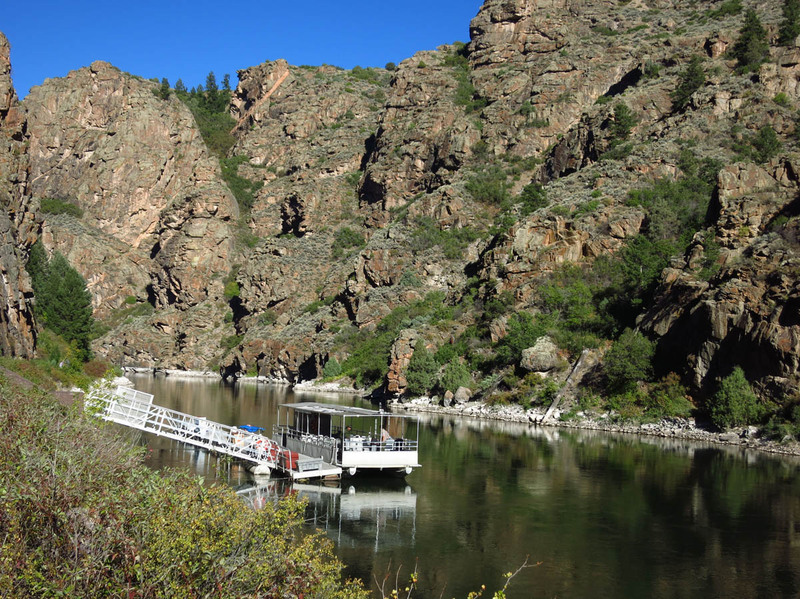 Hike down to the boat launch requires 232 stairs and a mile walk along the river. 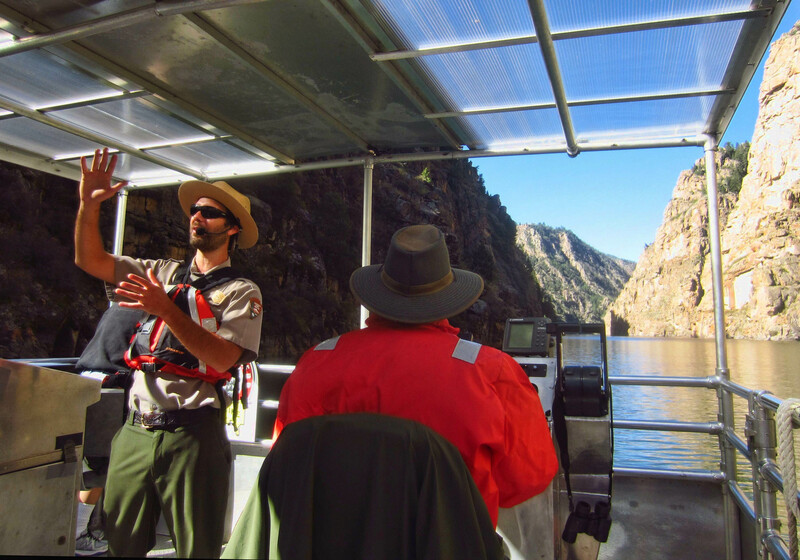 This 90 minute scenic boat tour travels seven miles up the Morrow Point Reservoir to the eastern end of the Black Canyon of the Gunnison. 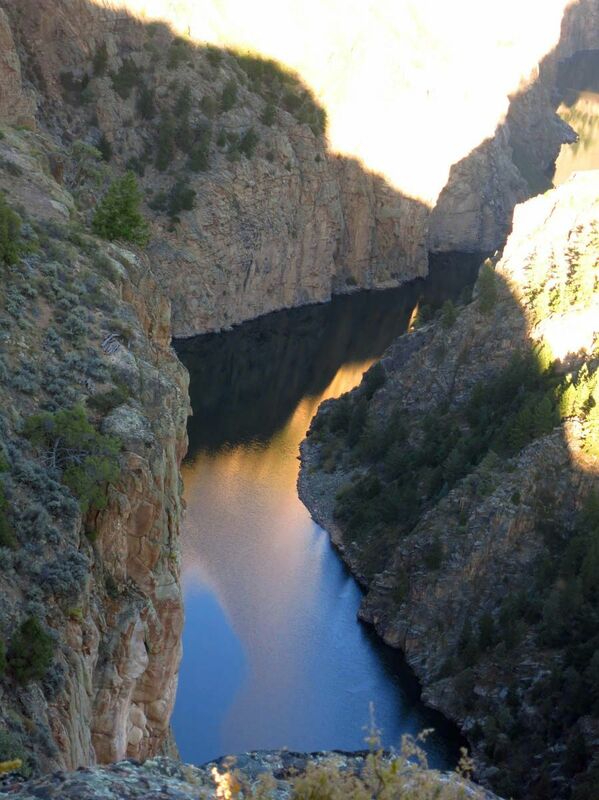 This stretch of the canyon follows what was once the northern bank of the Denver & Rio Grande Railroad, “Scenic Line of the World.” The Black Canyon section of the 3-ft narrow gauge line was started in 1880 by that same “General Palmer” who has a hotel named for him in Durango. It was constructed through the winter by Irish and Italian immigrants, who often descended into the canyon via ropes with nitroglycerin packs on their backs. The railway was rerouted in 1940, and most of the track is now submerged following the damming of the river. 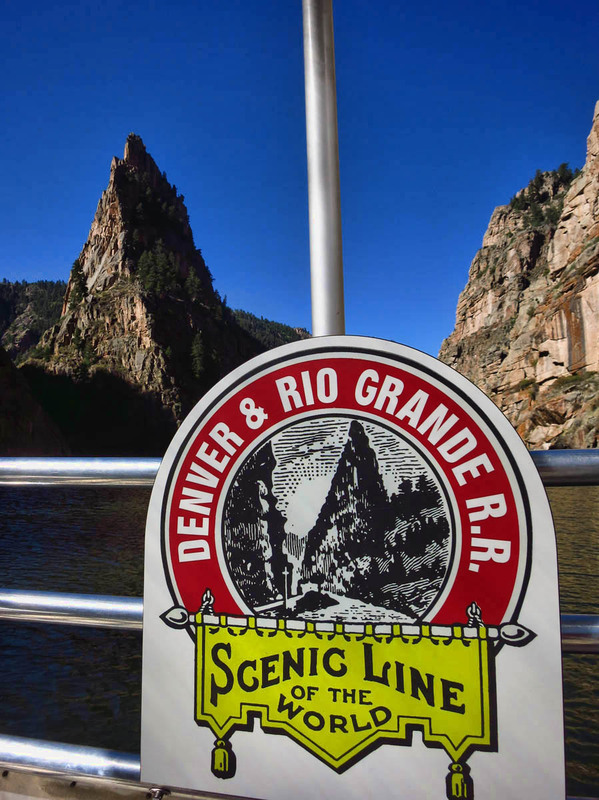 This is the iconic Curecanti Needle, 700 ft granite spire, which was featured in the logo for the Durango & Rio Grande RR. The mouth of Curecanti Creek. I hike down to this cove the following day. Canoeists come from their overnight camp at the mouth of Curecanti Creek. Having gotten a view of the canyon from the river, the following day I decide to hike the Curecanti Creek Trail to see the views from the rim. 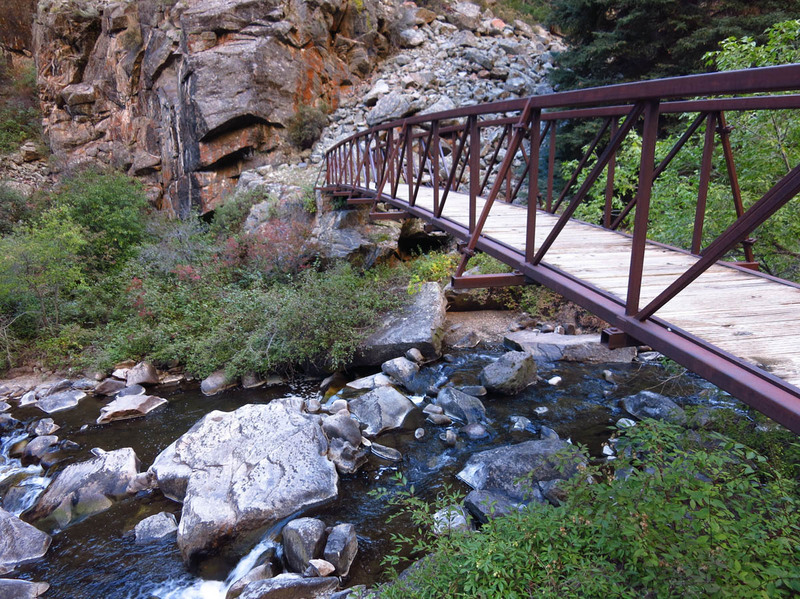 This is a 4 mile RT trail from “rim to river,” with a 900 ft. elevation drop. The trail starts off with views of the canyon, including the Curecanti Needle, 700 ft granite spire on the south bank of the reservoir, directly across from Curecanti Creek. Overlooking Curecanti Needle from the rim. 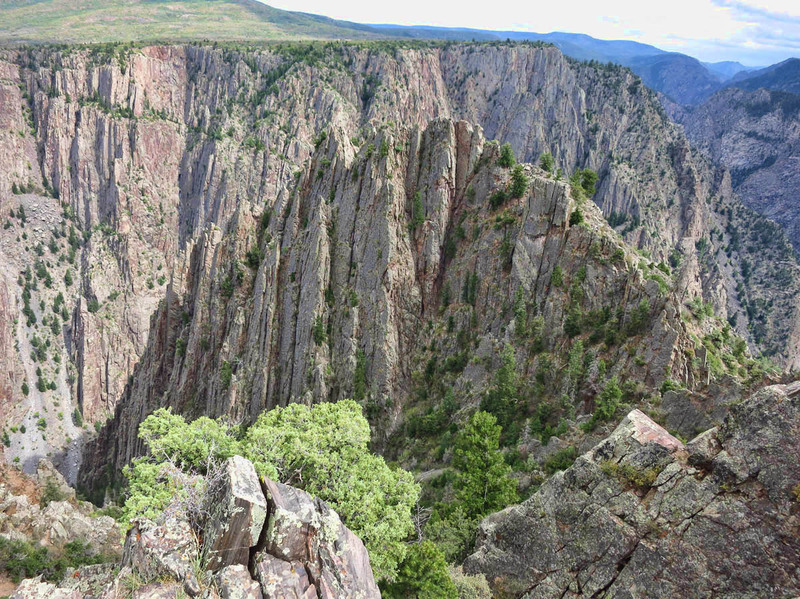 The walls of the gorge get higher, steeper, and more narrow further east as I move on to explore the Black Canyon of the Gunnison National Park, named for only a brief few moments of daylight that reach the bottom of the canyon each day. 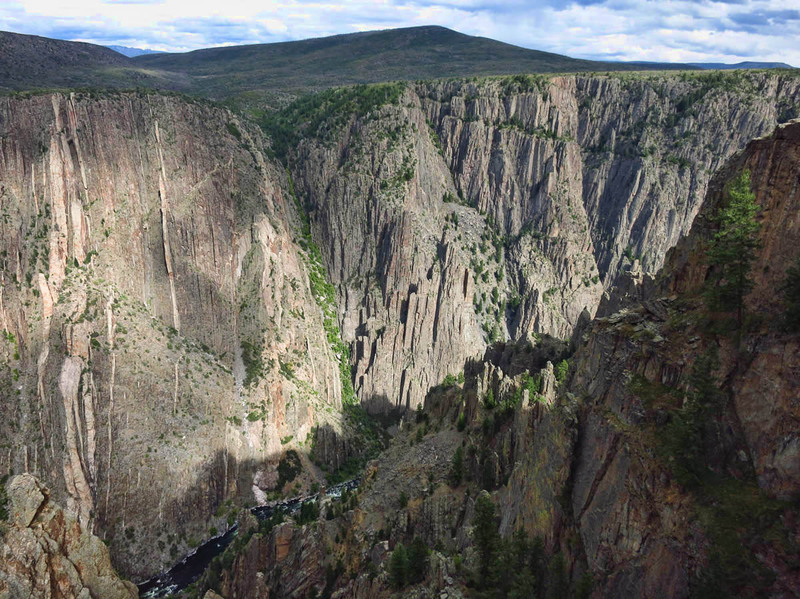 The steep, stark, foreboding walls of the canyon narrow down to only 40 feet across the Gunnison River at its most narrow point. 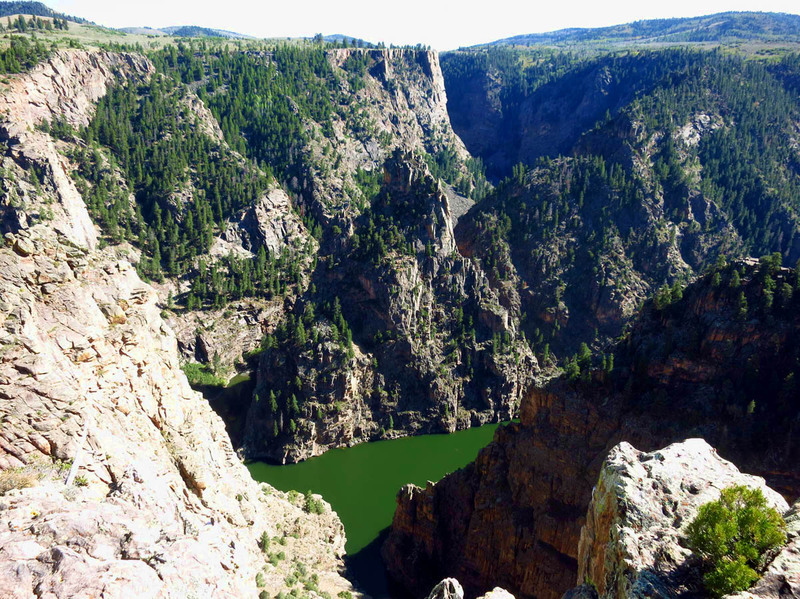 Prior to construction of the three dams, the Gunnison River was five times more powerful than today. 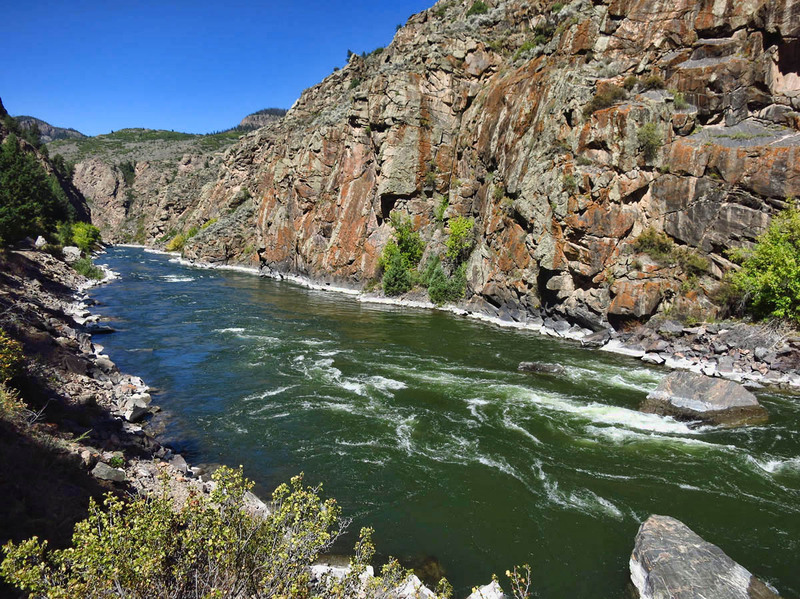 Still, the Gunnison River drops at an average decent of 43 ft per mile, compared to that of the Colorado River in the Grand Canyon at 7.5 ft per mile. 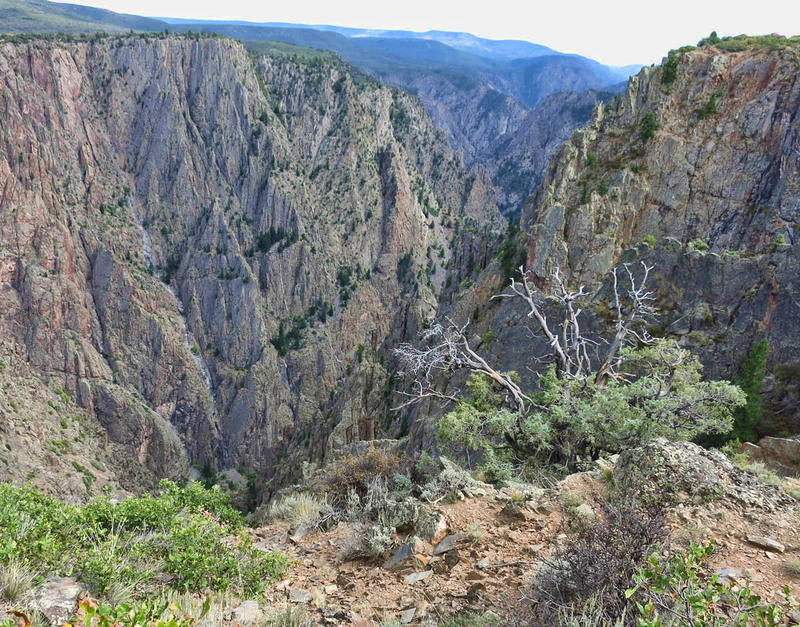 View of Black Canyon from Rim Nature Trail. 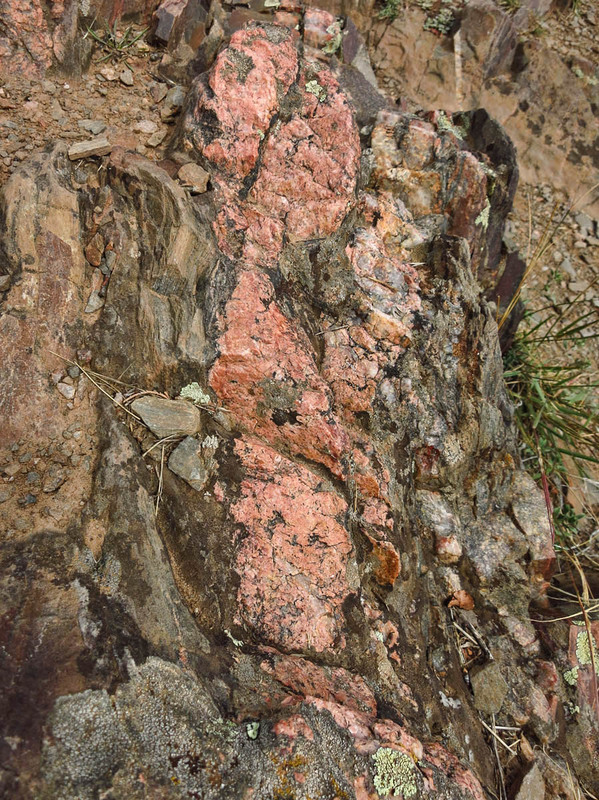 Beautiful pink pegmatite is interspersed all through the canyon walls. Note example of pink pegmatite “dikes” on far left. They erode slower than black rock, protruding from the surface. Many look at the canyon and see black. I look and see PINK! Amidst the black rocks are beautiful rivets of pink pegmatite, large crystals of a pinkish mineral called potassium feldspar. These “dikes” of pegmatite, are slower to erode than the black rocks, therefore giving off an embossed look to the canyon. The best example of this is the Painted Wall. 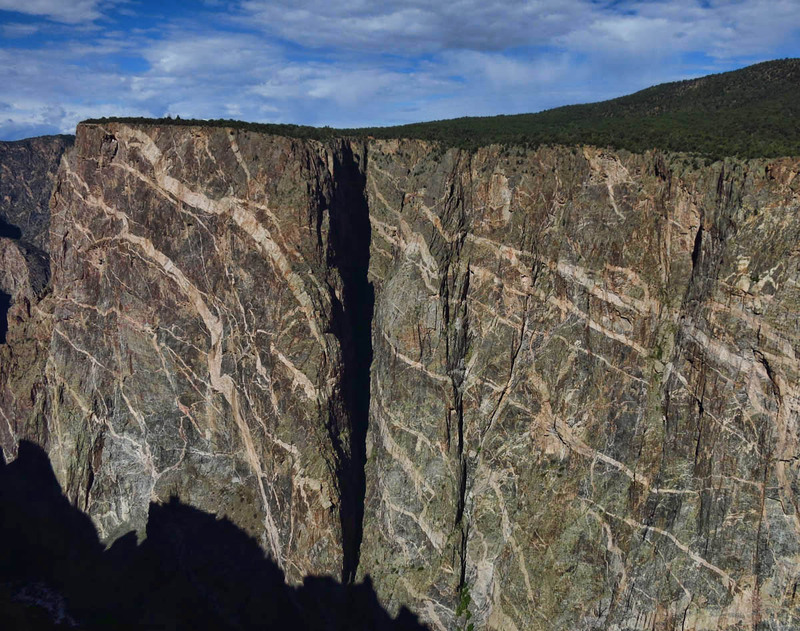 The Painted Wall, the park’s most iconic view, highest cliff in Colorado, 2,500 ft from river to rim. View from Oak Flats Loop trail. Wilderness permit is required for further decent into the Inner Canyon. Note lower Oak Flat Trail on bottom, right third of photo. 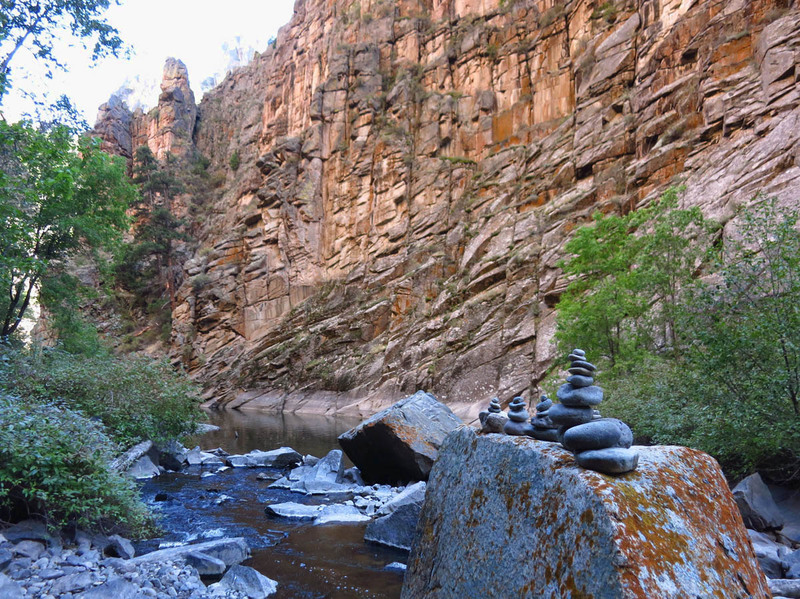 There are also three short hikes that offer a more intimate experience with the canyon. The first of these is a one mile OW hike along the rim from the South Campground to the Vistor’s Center. 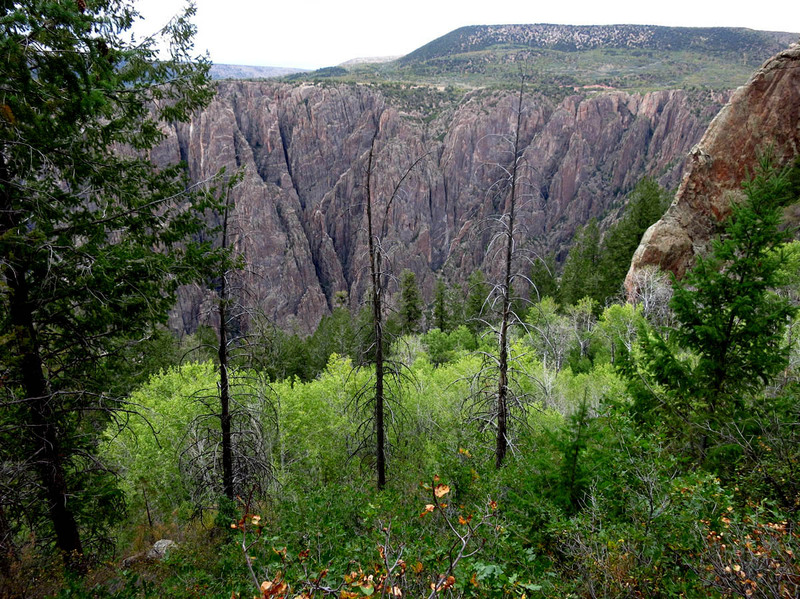 If you only take one hike, this should be it, as it follows the rim with great overlooks. 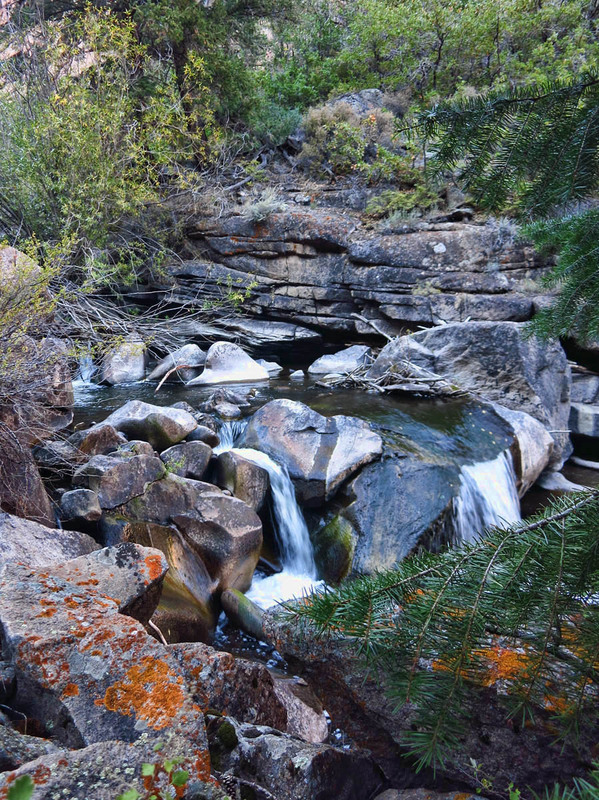 The second is the Oak Flat Loop Trail, two miles RT. This was my least favorite of the three hikes, because the first half was primarily views of oaks! If you don’t want to do the entire loop, just do the upper half for better views of the canyon. 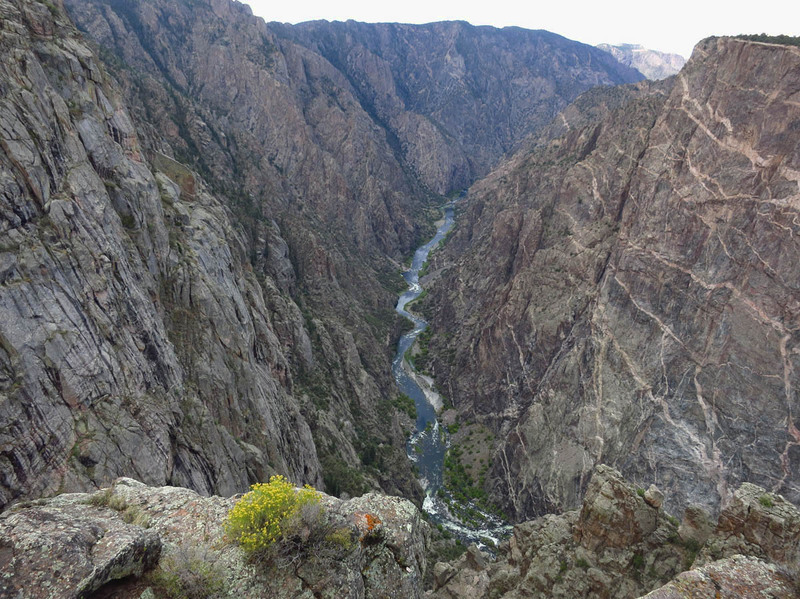 The third hike out to the end of Warner Point offers the most dramatic views where the canyon is at its steepest at a depth of 2,722 ft.
Silver ribbon that is the Gunnison River. 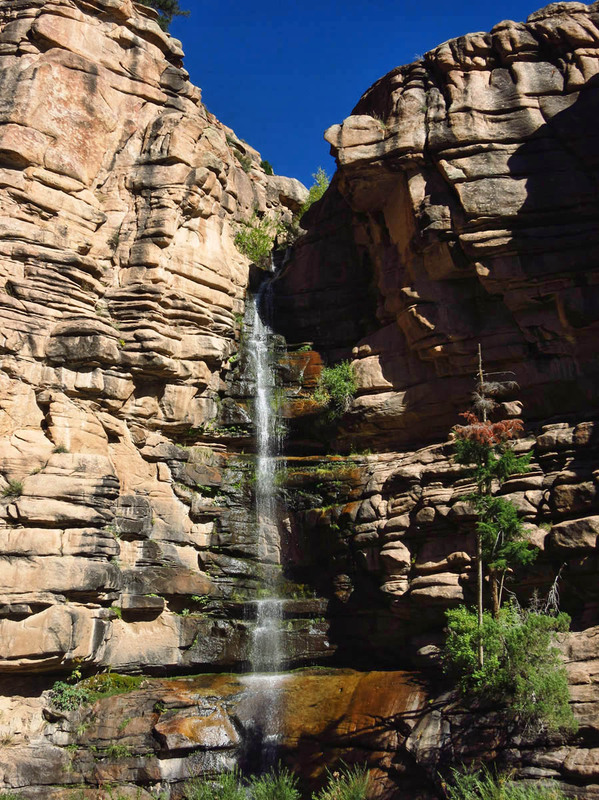 Of these three trails, the last two offer access into the “inner canyon,” which requires a free Wilderness permit. I would have loved to do this 1,800 decent to the river, as the wild and roaring river was beckoning. But there are no “trails” per se. One must follow the draw, or drainage ditch down the rough, rocky decent. 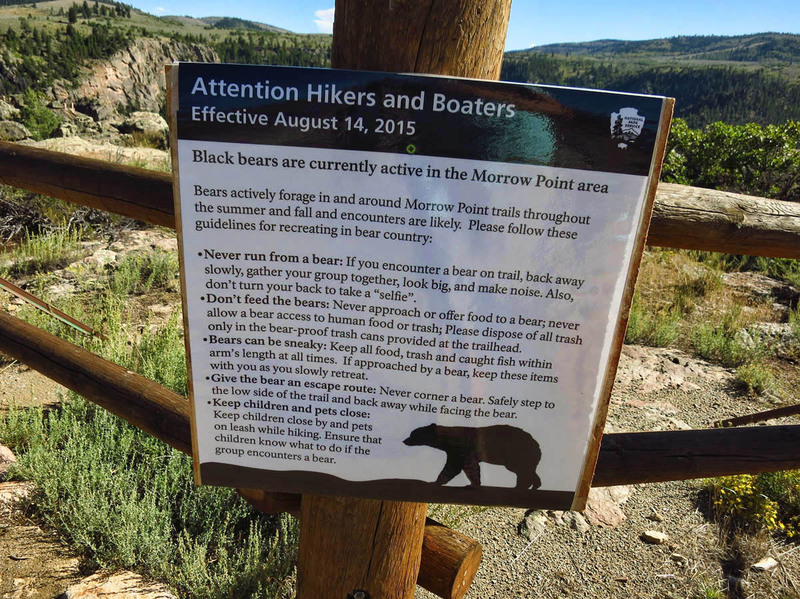 The NPS warns, “Routes are difficult to follow, and only individuals in excellent physical condition should attempt these hikes … Hikers are expected to find their own way and to be prepared for self-rescue.” I talk to the Park Ranger about the three possible access routes. She says it is deceptively easy to find the way down, but be careful because many people take a wrong turn on the ascent and get “cliffed out.” She also warns that it is extremely slippery, as it has been raining since I arrived. Finally, the sun comes out, which really makes the pink pop! As I stand at the Chasm Overlook, staring longingly down at the river, a gentleman comes up and asks, “Have you been down to the river yet?” I answer, “No, not yet, but I am thinking about it!” He then proceeds to tell me how it is not that hard. He lives in nearby Montrose, and has made the trip down safely many times, and it is well worth the effort. We are discussing the pros and cons, when he says “Just gear down, and stay off the brake.” It is then that I realize we are having two different conversations. He is talking about driving down via East Portal Road, and I am talking about hiking down the Draw. I say “Oh! I though you meant you had hiked it.” He replies, “I may be dumb, but I’m not stupid!” and walks off… Okay, I guess that settles it! 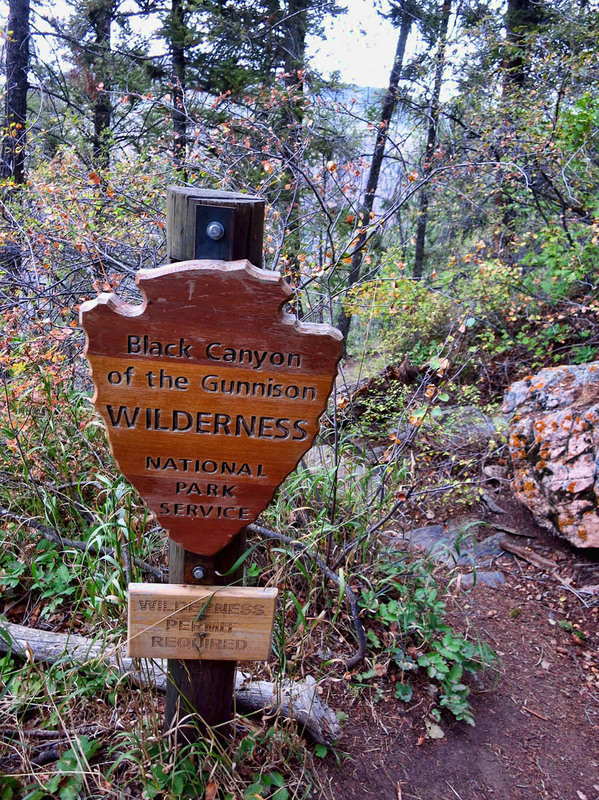 This entry was posted in Colorado, National Parks and tagged Black Canyon of the Gunnison National Park, Blue Mesa Reservoir, Curecanti Creek Trail, Curecanti National Recreation Area, Lake Fork Campground, Morrow Point Boat Tour by Suzanne. Bookmark the permalink. What a place! Didn’t care for Oak Flat Loop either. A group was departing for a canyon floor attempt as I left the park. Wonder if they made it. Gotta go rectify my error of leaving out 3 zeros from my statement about the formation time. Sorry to have missed the boat tour by such a brief margin. Thanks, Kim. Given our mutual love for the NPS, I am glad we both got to spend time in this beautiful park! There really are not enough words to let you know how very much I appreciate these wonderful write ups of your adventures. Most of them bring “bubbly” to my eyes, as I read them. Your photos are superb and really have a quality that makes me feel like I am right there with you. So – many thanks for taking the time and effort that I know it is to take these photos, process them, and remember the right words to go around each one. It is these words that make the pictures come to life. Judie — Your kind comments and compliments also bring “bubbly” to my eyes. Your remark, “words that make the pictures come to life” make my heart sing. Thank you for being such a loyal follower and friend. Seriously beautiful photography, coupled with insightful amusing descriptions…your blog is a true treasure for those of us who plan to journey and those of us who never will. Thank you! Thank you, Kathy for the very nice comment. It brings me joy to bring others along for the ride. We totally missed this place in our SW CO tour, and I’ve regretted it ever since. Seeing it from both top and bottom, like you did, is definitely the way to go. Excellent pics and writing, as usual. Thanks, Nina — There are lots of nice campgrounds long the Curecanti area that would offer a good place to park The Beast while exploring the area. Especially one who stops short of calling me “stupid,” right? haha!! Wow, how beautiful, and dramatic. We are happy that you decided not to climb down. We shall enjoy your descriptions here as we shall never be able to even take the boat trip after your description of reaching the boat. I love geology and this canyon is fascinating from that angle. thanks again for a grand set of pictures and prose. Thanks, Allen and Deede. 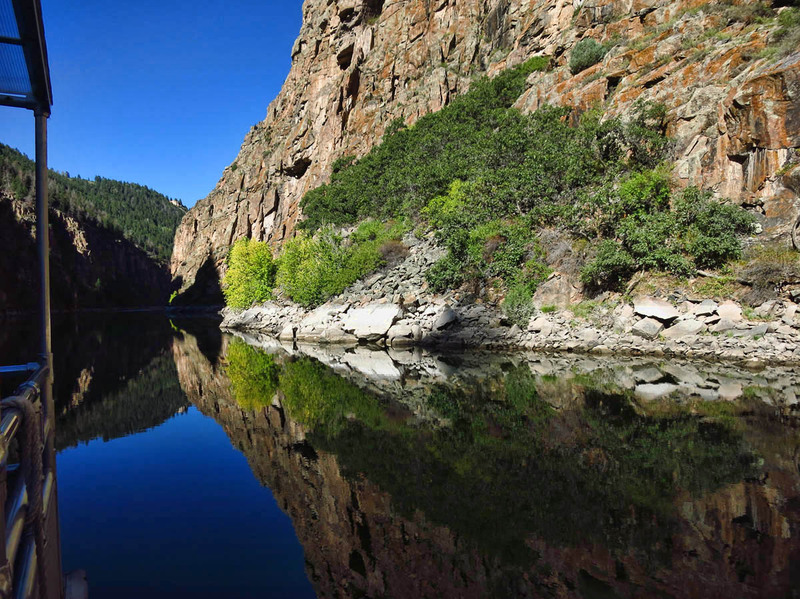 Although the boat ride might not work out, you would enjoy the South Rim drive through Black Canyon NP. 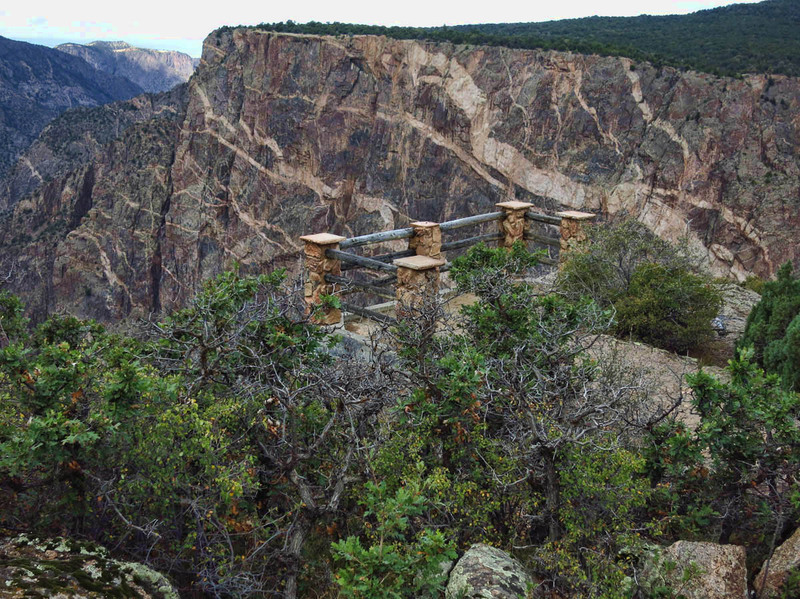 The Visitor’s Center alone offers a great view of the canyon for a geology buff! Such wonderful sites, with you amazing photography! Have fun reading your descriptions. I’m afraid most of these hikes are above my ability, now that I have some knee issues. Thank you. 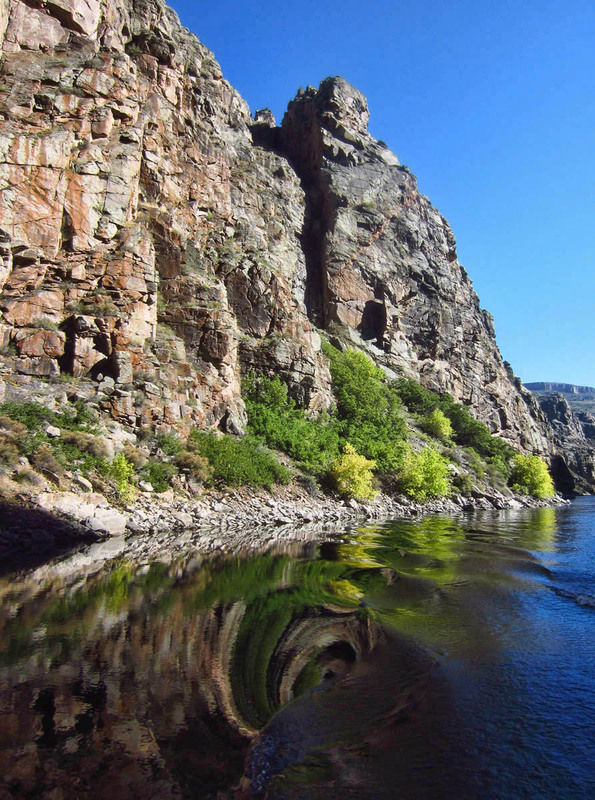 Thanks for the comment, Pamela — The hikes around the Black Canyon were pretty good, and since it was “out and back,” you could go as far as you are comfortable and turn back. There were lots of short hikes to the edge of the canyon rim. You got some really great shots of a beautiful place that’s difficult to photograph. We really enjoyed the boat tour and hike down the Curecanti Creek trail. Glad you liked it, too! Thanks, Gayle. I would have never known about Curecanti or the boat tour if it weren’t for you guys, so I am grateful for the intel! You have some amazing shots between the river trip and the various hiking trails. The pink rock is stunning, I can see how it easily captured your attention. Thanks for taking me to another spot I’ve yet to visit! 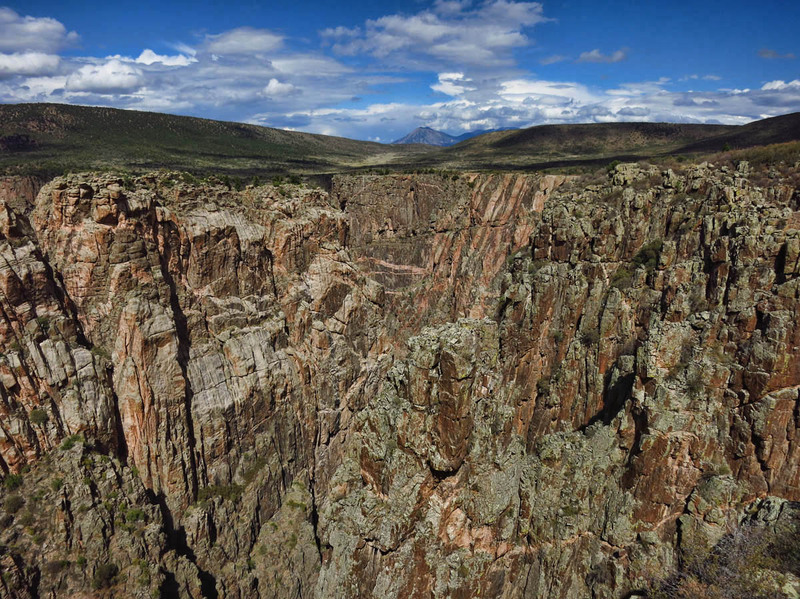 Lisa, I think you and Hans would like the Curecanti area, though you might get bored in Black Canyon for more than a day…still worthy of a visit next time you are out this way! Thanks again Suzanne for a great ending! How funny that you and the gentleman were talking about two different ways down!!! I guess that did settle it:) It is very hard to stand there and know that you could probably make it down there without too much trouble. But when the ranger said it was tough getting back out, that was enough to keep me away from trying. After being stuck on the Mesa in Capital Reef and struggling to find the only way off, I have a whole different outlook to these challenges. Wow ! Beautiful ! I drove past it once but didn’t take the time to explore. I love your coverage of Colorado !!! Amazing state that it is . Great photos and hike info. I read your blog all the time and just reply once in awhile , but sure do appreciate it. I have read about this area for some time but we have yet to get out there. After reading this post and seeing your beautiful photos it has inspired me to move this up on the list. I think after hearing the ranger say it was easy to lose your way coming back up the trail, I would have to accept that the hike would not be for me. We have been in a couple of situations where we weren’t sure how to find our way out of a canyon. We just left Ridgway and Ouray. 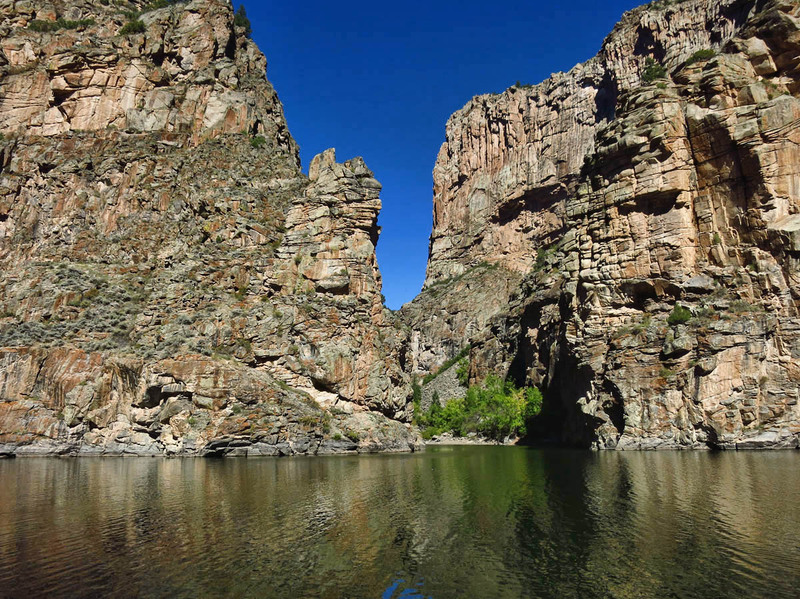 Never made it to Black Canyon, although we were in Montrose several times. Just too much to see and do. Boondocking at Mineral Creek just outside of Silverton. Now in Durango. We WILL make it to Black Canyon in the future. Thanks for the terrific “vicarious” tour thru words and photos.